All-purpose positioning straps feature a self-adhesive, back-to-back hook-and-loop closure that does not leave behind sticky, bacteria-trapping residue, making them ideal for securing, immobilising or positioning patients, equipment and more. Low-profile, medical-grade hooks and non-abrasive soft edges will not cut into or abrade skin, instead yielding and flexing against soft tissue to reduce subcutaneous shear. Whether in Theaters, Radiology or any acute setting, this convenient dispensing system can be wall mounted for quick and easy access to the most commonly used AliStrap sizes any time they are needed, helping to reduce inventory of unused straps and increase compliance. 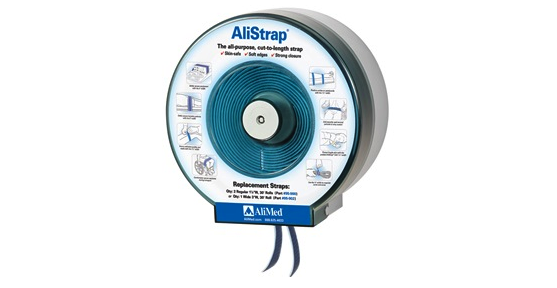 Holds AliStrap 1-1/2”W and 3”W rolls; simply cut to any length right from the dispenser.